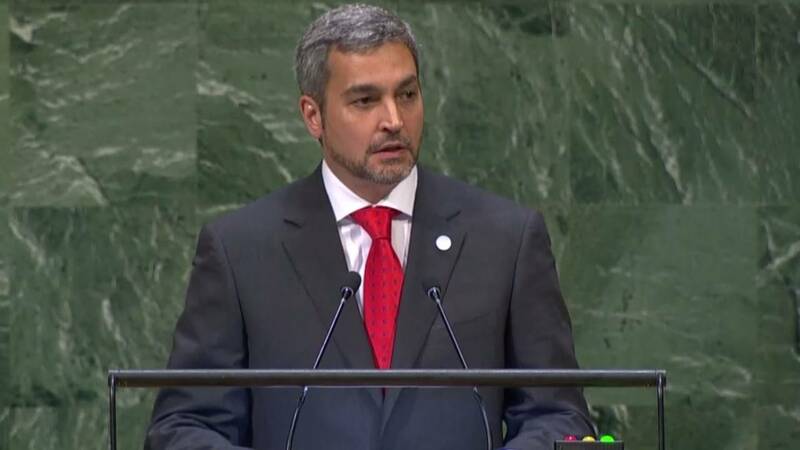 UNITED NATIONS - Latin American leaders followed President Donald Trump's condemnation of Venezuelan President Nicolas Maduro's regime at the United Nations' General Assembly on Tuesday. Trump said there is a human tragedy in Venezuela, as more than 2 million people flee the anguish inflicted by the socialist Maduro regime and its Cuban sponsors. He asked leaders to join the U.S. in calling for the restoration of democracy in Venezuela. "Not long ago, Venezuela was one of the richest countries on Earth," Trump said. "Today, socialism has bankrupted the oil-rich nation and driven its people into abject poverty. Virtually everywhere socialism or communism has been tried, it has produced suffering, corruption, and decay. Socialism’s thirst for power leads to expansion, incursion, and oppression. All nations of the world should resist socialism and the misery that it brings to everyone." In response, Jorge Arreaza, Venezuela's foreign minister, said Venezuela was a sovereign country with the right to choose its own path. "It's not the problem of the United States," Arreaza said during a news conference at the United Nations. Trump also announced more U.S. sanctions against Maduro's wife and his inner circle, which Maduro disregarded as an "imperialist" intervention by "oligarchs." "The empire points to us because it knows that we are on the socialist road to economic recovery," Maduro tweeted in Spanish. "And no one will stop us in our efforts to achieve self-sustainability." After Trump met with Colombian President Iván Duque Márquez, Maduro tweeted that he was willing to establish diplomatic relations with the government of Colombia to discuss trade and the sale of fuel in foreign currencies at preferential prices. "It would be foolish not to," Maduro tweeted in Spanish. BRAZIL: President of Brazil Michel Temer said Brazil has protected tens of thousands of Venezuelan refugees, has built shelters and provided assistance in collaboration with the United Nations. He said Brazil has also offered vaccinations and education to Venezuelan children and will continue to do so with the hope that there will be a permanent solution to the crisis. 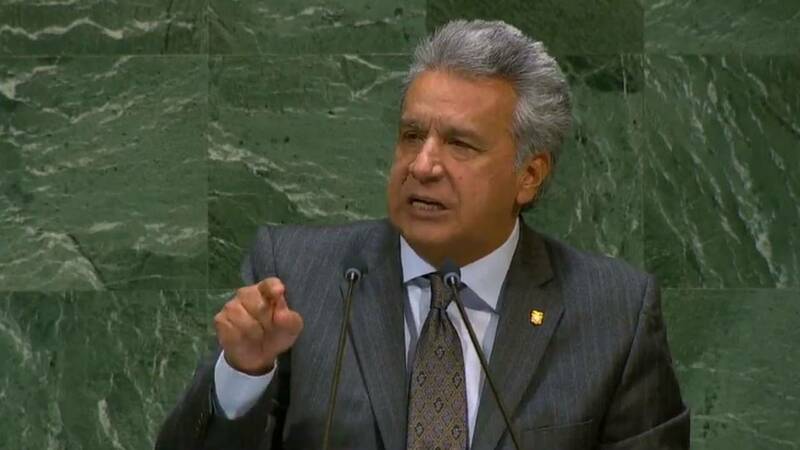 ECUADOR: President of Ecuador Lenin Moreno said he is dealing with a refugee crisis, and added the Venezuelan Diaspora is the largest in the history of South America. "When people emigrate, those who govern them are useless," Moreno said. MEXICO: Mexican President Enrique Pena Nieto said he doesn't support interventionism, but he does support a peaceful solution to the humanitarian crisis. Pena Nieto also said his country opposes the U.S. embargo on Cuba as an ineffective policy. PERU: President of Peru Martín Vizcarra said democratic establishments are impossible to sustain when there is corruption. 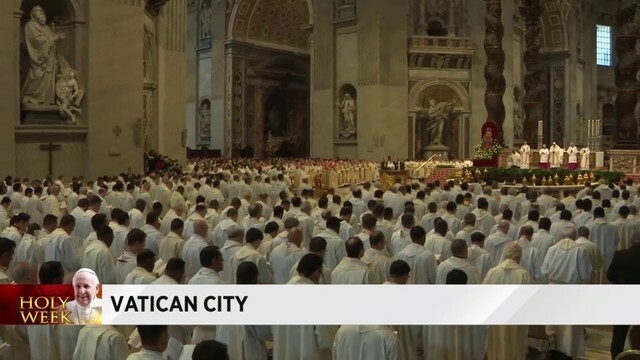 He also condemned the situation in Venezuela and said he was also concerned about human rights violations and extrajudicial killings in Venezuela. He said the massive flow of Venezuelan refugees is affecting the region and requires a collective response from the international community. IRAN: Iranian President Hassan Rouhani described U.S. sanctions as "economic terrorism." FINLAND: President of Finland Sauli Niinistö said something needs to be done about the refugees who are in need. PARAGUAY: President of Paraguay Mario Abdo Benitez said his government expressed solidarity with the Venezuelan people who are suffering under a dictatorship. ARGENTINA: President of Argentina Mauricio Macri said the dictatorship in Venezuela needs to recognize the humanitarian crisis and to respond to the Venezuelans who are displaced. He added Argentina has received 130,000 Venezuelans.